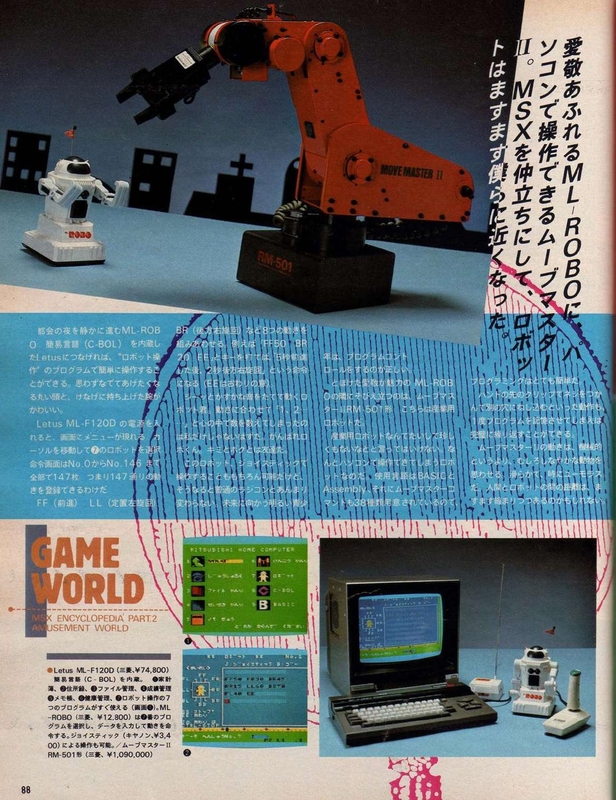 The Movemaster II Mitsubishi RM-501 Robot Arm is in the "MSX Harware List" as well as in "Generation MSX". I found a picture of it in the page 88 of MSX Magazine 1984-10. Attached. I can't read Nihongo, but at the price of 1.090.000 JPY I think this Robot Arm was not manufactured to be an MSX peripheral, nor intended to be controlled by an 8-bit machine. Even the control unit using RS-232C. This way, I think it was pictured in the article of MSX Magazine just for comparison/reference. Maybe you could review the listing of it as MSX Hardware, or then just add a note mentioning the article in MSX Magazine 1984-10 page 88. Thanks, I added the image and updated the text for now.